An autobiographical journey examining family relationships, life's transitions, love and baseball. John Simon is based in the northeast musical mecca called Ithaca, NY - (home of The Horesflies, The Burns Sisters, Samite, Bad Religion, Donna The Buffalo and many others). He's performed on college campuses and at public schools throughout New York since the mid-'70s and is known for his engaging humor and heartfelt personal material, delivered in a warm baritone voice with understated finger-picking accompaniment. 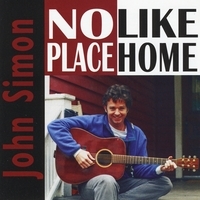 No Place Like Home is his second album of original material (1988's Together is currently being prepared for reissue) and features a number of his most-requested songs (including "My Old Man," featured on the Donahue Show, and "That's My Plan," written for his then-5-year old daughter Rosie and which has become an oft-requested father/daughter wedding dance song).